Coronary artery disease spans a wide spectrum of imaging appearances over the course of disease development and progression, and knowledge of this range of variation is crucial for the cardiac imager. Atherosclerotic plaques may be noncalcified, partially calcified, or heavily calcified which can affect image interpretability. A range of degrees of stenoses exists from early nonobstructive plaque to chronic total occlusion. In addition, particular plaque features have been identified that are linked with a higher rate of adverse cardiac events, which are important to recognize due to their potential clinical significance. Such high-risk plaque features include spotty calcification, low attenuation, the “napkin-ring” sign, and positive remodeling. 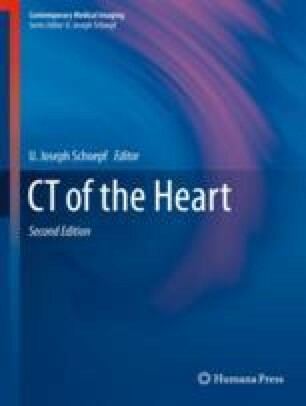 An awareness of the gamut of imaging appearances of atherosclerosis in the coronary arteries is an indispensible foundation when evaluating computed tomography (CT) of the heart.